This year, alcohol topped the list for the first time; it’s been hovering in the top five for the past few years, last year landing at a then-record #3. Possibly the recent popularity of Dry January (according to the article, 16% of British adults participated in 2016) is carrying over to Lent. “Chips” cracked the top five this year largely because British Prime Minister Theresa May announced she was giving them up for Lent. This announcement had knock-on effects lower down the list, with “her favourite thing” and “live mice” both coming in at #88. The announcement of the potential closure of a U.K. chip factory the next day led to further jokes. For my U.K. readers, yes, I know you call them crisps (and your “chips” are U.S. “French fries”); I would now tell myself in 2009, when I first started compiling this list, not to combine “chips” and “crisps” into a single line, but it’s too late now. Donald Trump is a big winner this year, landing at #22, just behind “Facebook” but ahead of “hope.” “The presidency” comes in at #52. In all, there are 1,002 tweets mentioning “Trump,” “President,” and “POTUS,” which is good enough for #10 on the list if we were to combine them all into a single line. “The dirtiest thing” (#66) refers to a campaign to give up non-renewable energy. 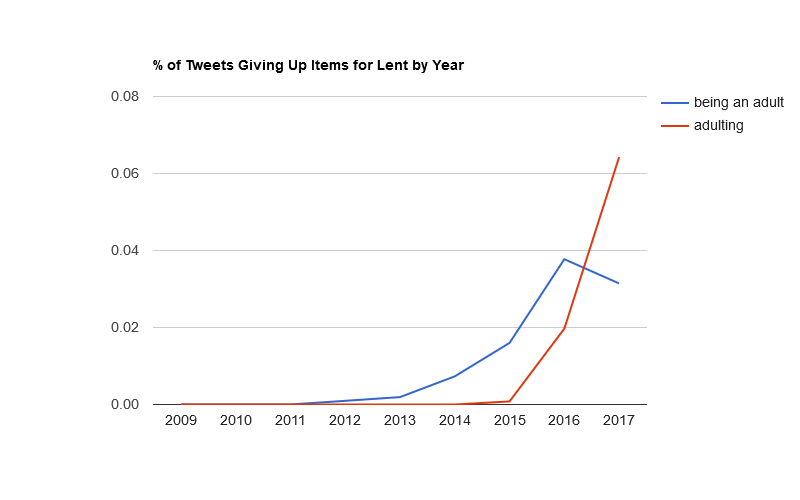 This year, 73,334 tweets (excluding retweets) specifically mention giving up something. 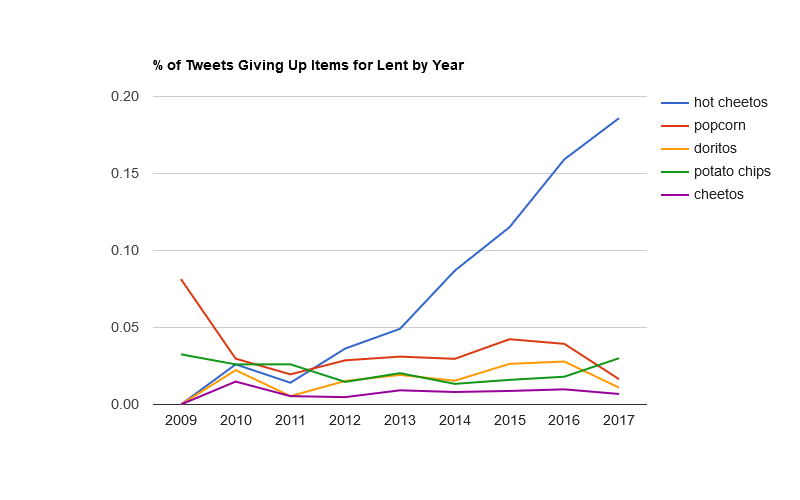 This total is up from last year’s 60,000 tweets; I used broader search terms this year (“lent” and “lent2017”) than I have in the past. In all, this year the analysis covers 694,244 tweets, up from 200,000 last year–again, largely because of the broader search terms. Chipotle now lands behind even Taco Bell. Hot Cheetos continue their snack-food dominance. It’s a verb now. Or at least a gerund. Just over 14,000 tweets (19%) included an emoji this year. I haven’t tracked emoji usage before, so I can’t say how that compares to previous years. * Excluding the top-ten emojis for the year. 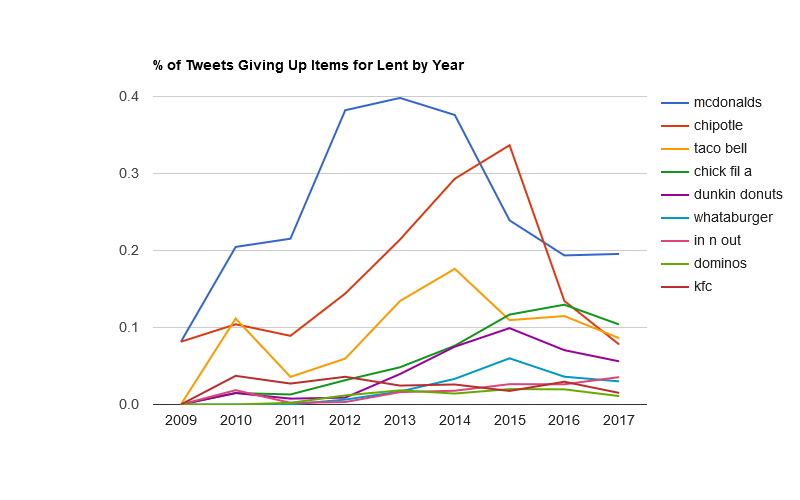 The rest of this data excludes retweets, but here are the three tweets mentioning Lent that drew the most retweets. I feel that this list encapsulates Twitter; not many other top-three lists would include college humor, the pope, and Rick “Never Gonna Give You Up” Astley. Lent is a new beginning, a path leading to the certain goal of Easter, Christ’s victory over death. You are currently browsing the OpenBible.info Blog blog archives for March, 2017.